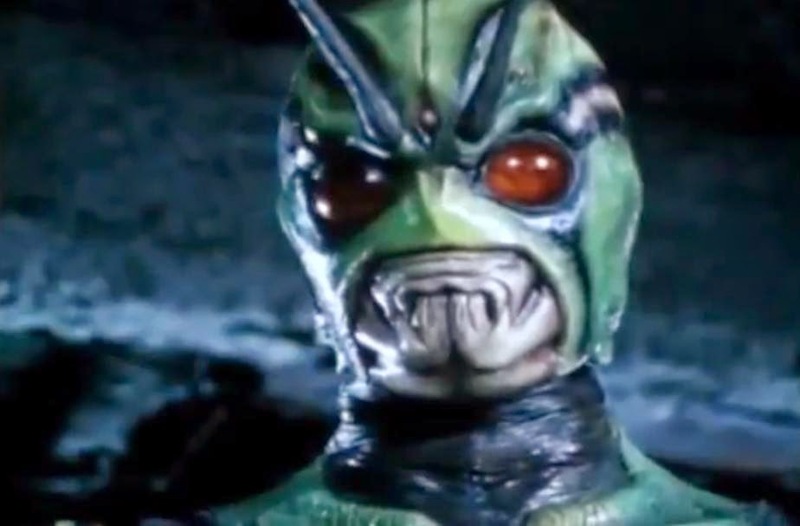 I've mentioned the weirdness of the 90s many times in the past on my blog, but I've never really talked about the Kamen Rider films on their own. So I recently sat down and watched the three films and one mortifying viewing of Shin long story followed by two regular viewings of ZO and J--I feel qualified to talk about them again! So let's begin with Shin, shall we? Shin Kazamatsuri is a test patient for research experiments to find cures for various diseases. The research, headed by Shin's father and the organization he works for, isn't as it seems on the surface. The shadowy syndicate funding the experiments, however, intend to create powerful cyborg creatures. Dr. Onizuka, who is carrying out these experiments and also performing them on himself, has his own motives to create super-human creatures by fusing their DNA with that of grasshoppers. Both Shin and Onizuka have become telepathic grasshopper based humanoids who are the targets of both the CIA and the syndicate. Onizuka is killed by the CIA, while Shin is forced into hiding. After learning that his girlfriend is pregnant with his child, however, he must save her and his captured father resulting in a massive battle between the syndicate's Level 2 Cyborg (Shin is the more advanced Level 3) as well as the CIA. This film is almost 90 minutes long. We're talking about the very thorough and detailed origin of a complex creature who doesn't have to be rushed into a costume by the 12 minute mark. That said, this film would've definitely benefitted from some editing. Twenty or so minutes could have easily been cut to get the pacing better. Nobody would've missed it. The feel of the film is certainly that of a drama. All of the sets are very practical and drab. In fact, the closest this film comes to having an over-the-top set is probably Onizuka's warehouse hideout. The labs, offices, outdoor settings, etc. are all very basic. The focus is definitely the story, all else comes second. Do I like this film? Yes. I have always been fond of the grittiness of this movie. 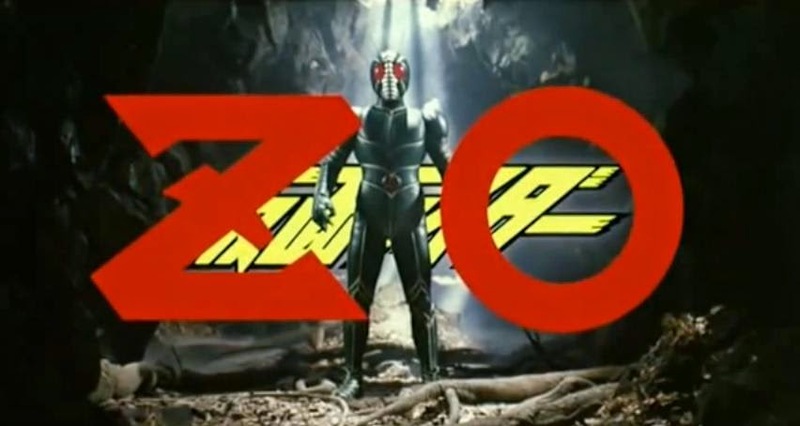 It was a new direction for Kamen Rider and VERY different from practically everything of the Tokusatsu genre before it. Shin himself looks awesome along with Level 2. The big blowout at the end is pretty damn spectacular as well. Masaru awakens to a voice pleading with him to save Hiroshi. Meanwhile, another creature named Doras forms among a scrap-heap and sets out to find Hiroshi. Hiroshi, who is the son of the missing Doctor Mochizuki (and who Masaru was the lab assistant of), is confronted by Doras. ZO arrives and disposes of Doras after a short battle. 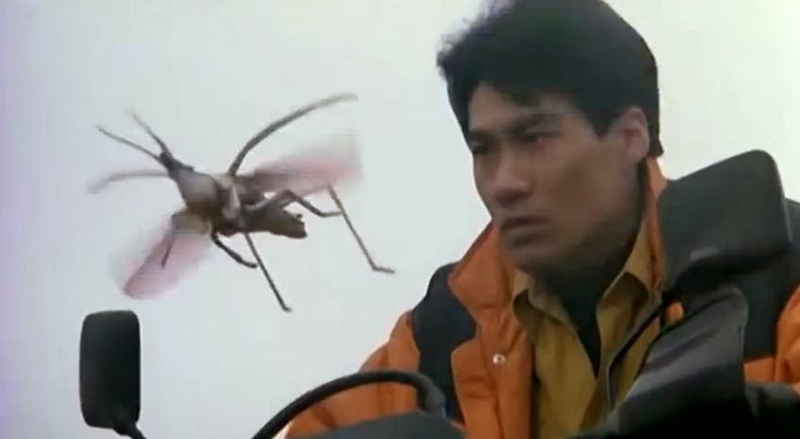 Masaru proceeds to follow Hiroshi around while the badly damaged Doras removes himself from the spike he was impaled on and dispatches two creatures to capture Hiroshi while he is given time to heal. Kumo Woman and Kumori Man both cause trouble for Masaru and Hiroshi, the latter of which manages to capture Hiroshi. After Masaru tracks Hiroshi down, he defeats Kumori Man and discovers the captured Dr. Mochizuki. He explains that Doras is really Neo Organism, which is the true source of his power. After a battle, Doras is eliminated along with the grotesque Neo Organism. Dr. Mochizuki dies in the explosion following the battle. Masaru says his goodbyes to Hiroshi after delivering him to his grandfather and rides off into the sunset. I'll cut right to the chase and say I love this movie. Everything about it is pure quality. They somehow took everything about Shin Kamen Rider, a great movie, did the opposite, and still came out with a fantastic movie. The look of this film is tradition Tokusatsu fare. The crazy sets and iconic locations mixed with practical locations all looked perfect. The cinematography is beautiful...seriously, the look of this film (including the amazing effects) is so good that it could pass as a new film (I really want to see this on Bluray--I have the DVD). Cameos! Lots of them here. Legendary singer Isao Sasaki (Goranger, JAKQ, loads of anime, etc.) plays Dr. Mochizuki. Several Metal Hero alum appear in the Karate scene. Off the top of my head it was Naomi Morinaga (Annie from Shaider), Kenji Ohba (Gavan), Masaru Yamashita (Fire from Winspector) and Iori Sakakibara (Draft Keace from Exceedraft). Oddly enough, Kou Domon, who plays Masaru/ZO would go on to play Sig in Blue SWAT. On top of that, Shohei Shibata joined the cast of Dairanger the same year as Akomaru. I would say that I love both Shin and ZO equally. They're both very, VERY different movies. Shin is gritty as hell while ZO is beautiful and what you expect a flashy Kamen Rider film to look like. It really boils down to release. Shin was a V Cinema (direct to video) while ZO was shown at the 1993 Toei Hero Fair along with movies for Dairanger and Janperson. I would recommend this film over Shin only because you are probably a nice person who enjoys sane things. Kouji is an environmentalist photographer who is camping when he is joined by a young girl named Kana. They both witness Fog and the three Fog creatures, in their human guise, who immediately kidnap Kana for sacrifice and kill Kouji. Kouji is taken in by ground people and an insect named Berry who endow him with J Powers to defeat Fog and rescue Kana. Kouji takes on Agito, who initially killed him, and defeats him after a short battle. He is later challenged by Zu, who is defeated after a short battle. Kouji is taken inside Fog and learns of their origin and how their ways have destroyed the environment of Earth once before. As Garai prepares Kana for sacrifice, he begins to fight J. Kana is awoken after Berry interferes with the spell. Garai is defeated by J, who is now taken on by Fog Mother itself. J grows to 40m to battle the enormous Fog Mother, freeing Kana in the process. After a deadly Rider Kick, he ends up face to face with the real Fog Mother inside who wants to take J down with her. He manages to free himself and escapes as Fog Mother explodes. Following their adventure, Kouji and Kana are relaxing on the bank of the river--Kouji snapping away with his camera. 1. The story is incredibly lazy. Environment=Good. Machines=Bad. Top that off with a kidnapped child and we're good to go. 2. The effects are awful. There is one...ONE cool shot in this film. There is a really long shot of Zu dragging J to Fog Mother. It looked pretty impressive, but I suspect this was entirely due to the angle that the camera was at in relation to the action. Everything else is garbage. I mean, at one point Garai has a lightsaber (complete with lightsaber sounds) to fight J. Rather than the "light" being a special effect, the sword itself was lit. It looked more like he was hitting J with a lightbulb. 3. The sets are terrible. Anything inside the Fog Mother tank/ship looks incredibly cheap. The only other sets are Kamen Rider Super 1's bridge, the river bank, the quarry, Berry's hideout. 5. J, while Jumbo, is fighting a tank. It is possibly the most uninspiring fight ever. It's just a few minutes of J breaking things off of Fog Mother. 6. The narration. It's all over the place. It shouldn't exist in the first place. At some points there is a narrator, but then Geki Kouji was doing some of the narration when the dinosaur scene popped up. 7. Wooden acting...all parties guilty. 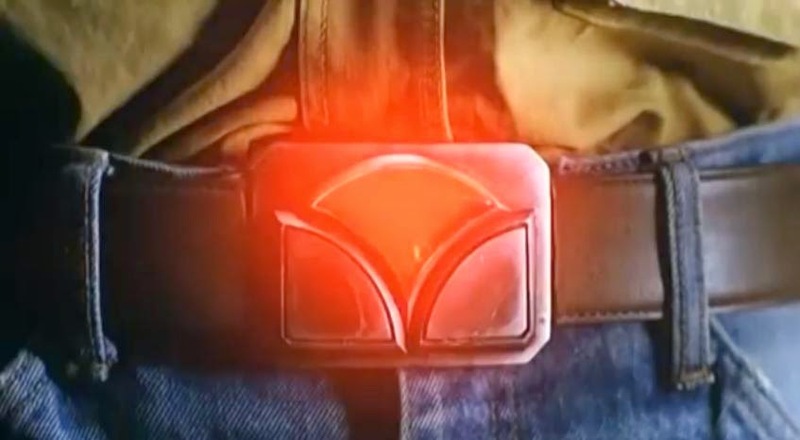 A Henshin Belt! Finally...after being skipped over by Shin and ZO, J gives us a Henshin Belt. It might be pretty stupid looking, but it's something! This movie manages to be the opposite of both Shin and ZO, which are opposites to each other, and be a bad film. It takes forever to see Kamen Rider (In ZO we saw him immediately with his first fight coming around the 9 minute mark), and when we do it's pretty pathetic. The bike stunts are cool enough, but are kinda an afterthought. Good for a watch every once in awhile, but the lack of variety and copious continuity problems make this a difficult film to watch alongside Shin and ZO everytime. To cap off the 90s Ishinomori film series we saw Jinzoningen Hakaider in 1995. I talked about that one in the past and definitely recommend a viewing! I also reviewed all of the CD Soundtracks for these films a little while back. Give that a read for maximum completeness! In the future I intend to review the original hero movies that Toei made (Lady Battle Cop, Zebraman and it's sequel) along with Kamen Rider: The First, Kamen Rider: The Next, and maybe even the three Sukeban Deka movies (1987, 1988, and 2006). Stay tuned for that! Now if you'll excuse me, I'm off to beat up a giant, immobile tank because I'm a hero and DON'T YOU FORGET IT! P.S. This post has a Top 7 List. More Top 7 lists here! New Kingranger Custom Project! SH Figuarts Lady Battle Cop! A couple of months ago I stumbled upon the pictured model kit. It is a 1/12th Scale model of the titular character from Lady Battle Cop. Lady Battle Cop (or Onna Battle Cop...same thing) is a Toei one-off film from 1990. It was basically a ripoff of Robocop, but it served as a kinda important role in Toei chronology. Following the Shotaro Ishinomori penned Star Wars ripoff Uchuu kara no Message (seriously...the Japanese government stepped in to delay the opening of Star Wars in Japan so that this film could be released first) there was a twelve year gap in production for original Toei films. 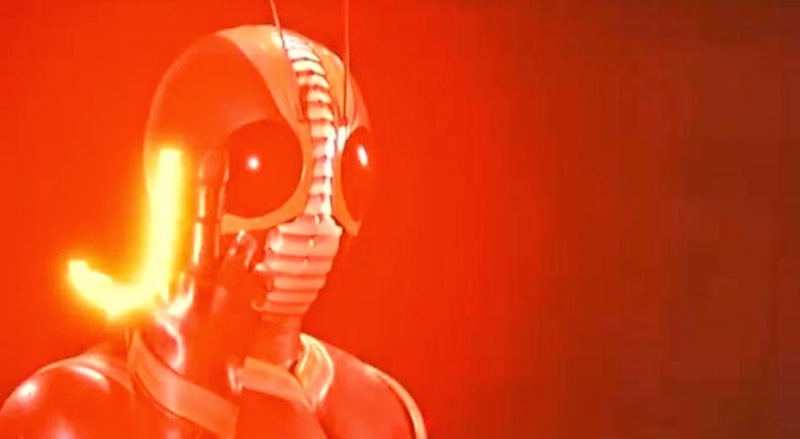 We did see festival films for many Tokusatsu series that were airing on television as well as the two feature-length Sukeban Deka movies (which were decent), but nothing original. Lady Battle Cop came along and changed that. I'm not sure why this film was made (I guess they felt that Jiban didn't do an adequate job of being their Robocop) but it opened the door to a nice run of original Kamen Rider one-off films (Shin, ZO, J) as well as the reimagined Jinzoningen Hakaider to cap it off. 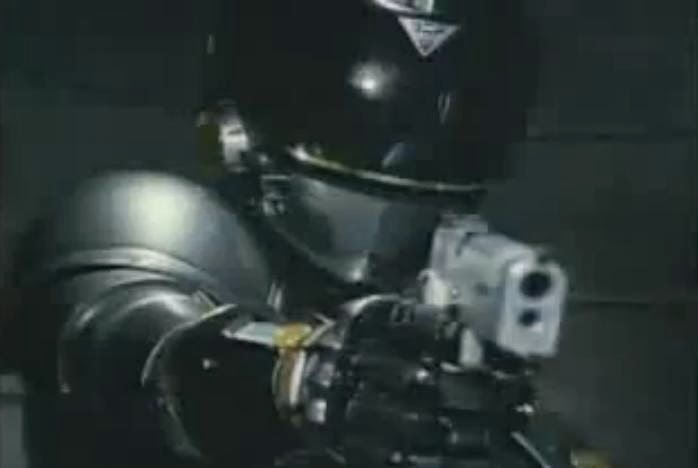 Sure, Kamen Rider is a franchised series...but Lady Battle Cop is virtually a Metal Hero movie given the costume and "heavily armed cop" nature of Metal Hero shows of the era. Rider was dead at that point anyway. The film...well, I'm planning to review Lady Battle Cop in the future along with the 90s Rider films (I did Hakaider already). So...stay tuned! I've always been a fan of the costume from Lady Battle Cop. It has always been a bit of a bummer that there was never any merchandise from the film outside of the soundtrack, a CD Single of the two songs from the movie, a VHS, and a Laserdisc. That is.......until I discovered this officially licensed 1/12 scale model kit by Argo Nauts on my regular sweep of YJ Auctions... Perfect scale for Figuarts! I put in a modest bid for the kit...and won it for a reasonable price (cheaper than the aged ¥3000 sticker on it). Woohoo! So stay tuned for updates! Both of us are on Twitter @CCLemon99 and @kingrangerprops.